Crossed Genres Magazine 2.0 Book One! This anthology collects issues 1-6 from the zine: 18 stories and 6 New Author Spotlight interviews. 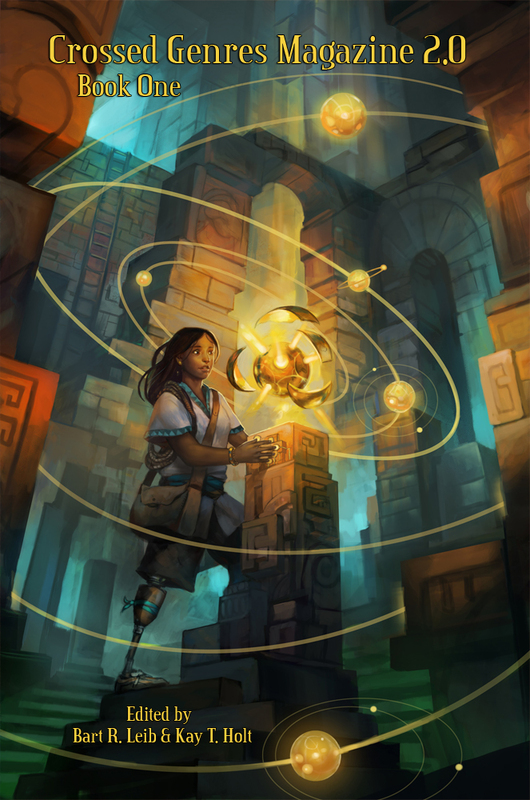 The original cover is by Hugo Award-nominated artist Julie Dillon! We’re excited to share this anthology with you, and we hope it’s the first of many more – someday we want to see shelves filled with nothing but further volumes of CG Magazine anthologies! CG Magazine 2.0 will only continue past 2013 if it can sell enough subscriptions to fund it. Based on the subscriptions we already have, we need another 300 NEW subscriptions by the end of the year. When we resurrected the magazine in 2012 thanks to a surprisingly successful Kickstarter, the idea was not just to bring back the popular zine, but to make it into a self-sustaining publication that – hopefully, as of January – will meet the requirements for a SFWA-qualifying market. We are on track for that goal… but unless we can build up the subscription numbers, we won’t have the funds to continue CG Magazine into 2014. As with all CGP publications, CG Magazine actively seeks and encourages diversity and broad representation. It also directly supports new voices with a guaranteed spot each month for a story by an author with no previous pro-rate sale and a New Author Spotlight interview. Subscriptions to CG Magazine are just $15/year for ebooks, or $30/year for print+ebook. Please read an issue or two (free on the website), consider subscribing and helping us reach sustainability (and SFWA-qualifying status)! The “Keep CG Magazine Going” subscription drive starts now!